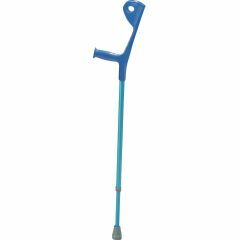 AllegroMedical.com presents The Euro Style Light Weight Forearm Walking Crutch. The Euro Style lightweight aluminum forearm crutch by Drive Medical adds style compared to traditional forearm crutches. The design features a one piece molded forearm cuff and hand grip assembly which can be height adjusted in 1" increments to allow for personal comfort and sizing. At 1.5 pounds each, this crutch is lighter than traditional style forearm crutches. EuroStyle crutches beat standard style. Easy To Use. Safe. Lightweight. Supports Weight. Well Constructed. Short Term User. Long Term User. I used standard forearm cruthces when I was 24 to retrain my legs due to a car crash. Now I'm on the rebound from MRSA a multiple infection that laid me up for four months. I'm using a walker I bought from Allegro Medical, this is due to my physical therepist order, who sais, "I'm not ready to use forearm yet. Understand, I used two canes since 1995 and have worn AFOs on both legs since 1971, and now have to retrain knee muscles. Safe. Lightweight. Supports Weight. Easy To Use. Wet Weather. Outdoors. Long Distances. Indoors. Short Distances. I previously had the metal foldable version of these which were great for travel and seemed better constructed. BUT these are more balanced and easier to use. Light weight. Stores Easily. Well Constructed. Supports Weight. Easy To Use. Safe. Supports Weight. Lightweight. Safe. Well Constructed. Stores Easily. Easy To Use. I would be willing to pay for a "retention strap" to hold the crutch at forearm while, for example, opening a door, or shaking hands, etc. It is good that there is a hole in the plastic forearm support - I use a small dog collar through the hole to act as a loosely fitting "retention strap". This works perfectly well. Safe. Lightweight. Well Constructed. Supports Weight. Easy To Use. I recently developed bone spurs in my hips and tried to use a cane for a month or so. These crutches are so much more stable it's like night and day. Several medical professionals have been quite impressed that something so light and inexpensive is so strong. My only complaint is that always I have to find someplace to lean them. Awkward at a checkstand. Why don't they make tripod tips for these? What is the diameter of the tips? I have a pair of crutches that I can no longer find tips for at my local drug stores. If I can't replace them when they break through, there is no point in ordering new ones that I will have the same issue with. I would like a pink forearm crutch. I sent for one but it's really red. Does it come in pink? NO! IT SAYS RED right on the colors list!!! !